Yesterday, March 6, Crown Princess Victoria made her first engagement of the year when she gave the opening address at the Baltic Sea Future conference. You need to know something, you guys, this is very important… Princess Sofia cut her hair and got rid of the center part. Yep, at the Swedish Academy Formal Gathering (which brought out all of the Swedish royals) on Sunday, December 20, Princess Sofia debuted a new hair cut and wore her hair with a side part. 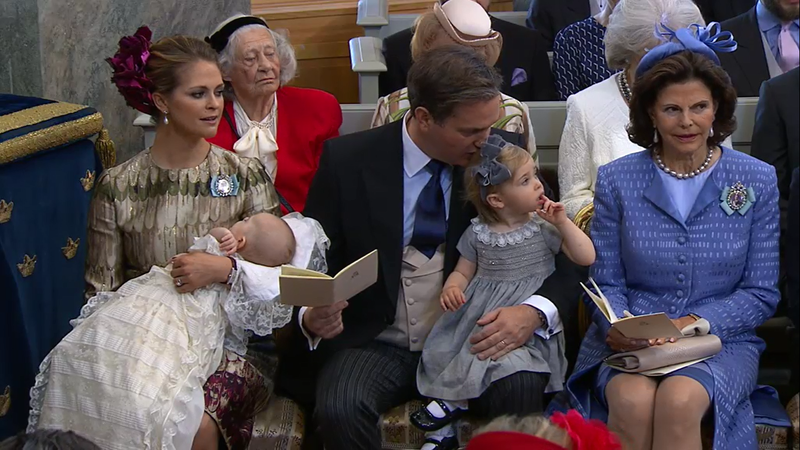 Prince Nicolas of Sweden, son of Princess Madeleine and Chris O’Neill, was christened this morning in a televised ceremony at the Drottningholm Palace chapel in Stockholm. Princess Madeleine gave birth to a baby boy today at 1:45PM Stockholm time (7:45AM Eastern US time). The new prince weighed 3080 grams (or about 6 lbs 8 ounces), and was 49 cm (or about 19.3 inches) long.